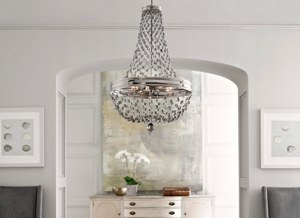 Make a style-defining statement with one special, eye-catching fixture. “The Better Show” recently featured a segment showcasing the top lighting trends and the 2014 issue of Lighting magazine, published by Better Homes and Gardens and the American Lighting Association . A nationally syndicated lifestyle TV show, “The Better Show” focuses on a variety of issues related to home and family life. View the 4-minute video to get some new ideas for your home. See the newest lighting products and learn more about lighting trends at a Hortons showroom. To find design inspiration for your home, you need look no further than the 2014 issue of Lighting magazine. The new magazine features before-and-after transformations that show how lighting can completely give your home a whole new look. Also included are many photos and design tips. For example, one way to mix different types of fixtures is to select items made of a consistent material, such as stainless steel. Also, updated materials in contemporary light fixtures include diverse choices like textured glass, wood grain, or even leather. For more home lighting ideas, you may pick up your complimentary copy of Lighting magazine at a Hortons Home Lighting store. Request a complimentary copy of Lighting magazine or view it online. What is the best kind of light fixture to use on a vaulted ceiling? In a room with a vaulted ceiling, it is best to use fixtures that can be adjusted downward, so that they cast light both upward and downward. Many pendants and chandeliers will work well in that type of space. Lights that are too close to the ceiling can create shadows.